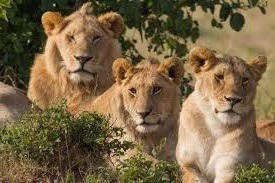 Lions are one of the prime Uganda safari tour wild game attractions that are part of the big five land animals that continue to make Uganda and parts of savannah Africa in general a destination of world travellers. Lying in the shadows of Rwenzori Mountains, Queen Elizabeth National Park is one of the largest protected areas in Uganda with great counts of attractions and tourist activities that have made the most visited park in Uganda by travelers on Uganda safaris and tours. The savannah rolling landscapes of Queen Elizabeth stretching across the rift valley flats are a habitat to multitudes of lions and lionesses. Talk of the Kasenyi or the southern sector of Ishasha where the unique tree climbing lions are known to exist, the park is among the few parks in Uganda where the percentages of encountering lions while on safaris and tours in Uganda are high. The misfortune came in the last days of January 2015 when a stray lion attacked the three residents of Kasese the parks neighboring district leaving them with regrettable injuries. The residents of Kyapa Village, Nyakabingo ward II who came to be known as Philemon Bwambale, Yoweri Magambo and Raymond Muhindo who claim that they were picking cotton before being attacked by the lion narrowly survived and are apparently in two different health facilities in the town of Kasese but with remarkable improvement. Though there are mixed assertions that the incident might have occurred when the lion pursued them following their routine hunt, the issue of lion had already been identified as it had earlier reported to have consumed livestock in the same village. It bit Mr. Bwambale as he was trying to rescue his brother Mr. Muhindo whom it had already knocked down in the garden of cotton. Magambo also got injured in the process of running to rescue them. The entangled lion was later brought to the end of its life, skinned and its meat was shared amongst the hunting participants. This can be Okayed as the law permits any one to kill a wild animal in self-defense following an attack and then report to the respective authorities later.